It was last year; and the fact that I just write this today, is because I DO need that much time to recover. I didn’t heal fast when my longtime friend(s) backstabbed me and I lost everything. Not even when I likely had tried everything, visited many places, and met with new people; there was still part of me that still lost in limbo and couldn’t live the same life after. My life had turned upside down, and I was stuck, not knowing what to do. Until I found a cure, lessons, that came from an unlikely source –a philosophy of more than 2 millennia old, practiced by them who’s called Stoics. The same philosophy that accompanied Nelson Mandela in his 27 years imprisonment, guiding and comforting him until his eventual victory of fights against racial inequality in South Africa. This writing is about that lessons. One of the beauty of this philosophy, is that it doesn’t necessarily negate or against the religion or ideology I’m currently believing in. It even proves that with human efforts to think and contemplating life, it can also find the universal truth that understand life as it is how it is. If you look up for “stoic” in the dictionary, it will relatively mean someone that’s “determined not to complain or show her/his feelings, especially when something bad happens” (Cambridge Dictionary). It’s not wrong, because it is a colloquial saying derived from the term “stoic”, a person that practices Stoicism, subject of philosophy that I meant before. But Stoicism that’s been practiced and perfected by Stoics for centuries is more than just and attitude to be calm, it has set of worldviews, virtues/values, and spiritual exercises. On practical level, Stoicism teaches us about self control, social tolerance, and virtue of life. For me (and I hope you as well) I learned that I was just a mind away to be happy. Imagine you rented a room while you’re studying or working. After a year you’ve been a loyal and good renter, suddenly your landlord asking for a 7% higher pay. You’re then disappointed, want to refuse that raise, but you can’t. Couldn’t find any better place, you then gruntingly pay more for the same room. You think it was unfair. You’re mad at your landlord. But what if you already understood in the first place, that (presumably) annually our economy has inflation at 7% rate. Knowing that, in the first day you made a deal to rent a room from your landlord, you already expected that the next year you’ll be paying higher. Then after one year, when your landlord asked for higher pay, you had no problem with that. You’re fine, you’re not mad at all, because you’re already expecting the raise. Compared to the second scenario, the first problem from the first scenario (that we’re mad and disappointed over a rental raise) didn’t happen because we’re already expecting the upcoming circumstances (the raise). We know that it’s normal for a rental cost to have an increasing value over a year, so we’re prepared for paying more the next year. We set our expectation right, because we understood it rationally. Problem happens when our expectation doesn’t conform the reality. And most of the time, we have no power or control to change the reality to suit our expectations. But we have control over our mind, rationally, to conform the unchangeable reality while we improve ourselves. The case of renting a room above, applies to every other problem in our life. We hard to cope with heartbreaks, sadness, anger, disappointment, and anxiety; is mostly because we can’t control our rational mind to set the right expectations. We’re very shook when someone we love suddenly broke our heart; friends we trust backstabbed us out of nowhere; or project we hope to succeed had to end up being a failure. But what if starting today, we understand that people are changing; that they have a good and a bad side, just like ourselves, just like everybody else; and we also understand that our big project doesn’t have a perfect chance to succeed, because it depends on so many factors. Knowing all that, when the worst scenario did happen; when our loved one broke our heart, our friends left us, or our project ended up fail; we’re still able to retain our good feelings even though our circumstances seem bad. Because we’re prepared for that, in our mind, rationally. It is one of the attitude of a Stoic. Unlike most of any other philosophy, Stoicism doesn’t concern itself with intricated debate about the universe and humanity in general. It is focusing on how to help human overcome destructive attitude, emotions, and act; and what can be acted upon. It is quite relevant with our modern life, because it teaches us on how to deal with social dynamics, retaining self control, and improving our life. And I think that is the best part of this philosophy, because it offers practical wisdom, not just thought-provoking subjects that lead us to an endless debate. It’s built for action. Stoicism is a school of philosophy that flourished in Roman and Greek world from early 3rd century BC until the 3rd century AD. It got its name from Stoa Poikilē (i.e. “the painted porch”), where Zeno of Cyprus taught the philosophy to his students. Zeno of Cyprus, a wealthy merchant-turned-philosopher who established the school (of Stoics) in Rome at around 301 BC. Seneca, a famous Roman writer who wrote many manuscripts about stoicism, like “Letters from A Stoic”. Epictetus, a famous stoic who also wrote opus like “The Art of Living”. As an institution, school of Stoics had faded away, but its influences remain until today. In 16th century, Justus Lipsius tried to establish Neostoicism, a movement that attempted to combine the beliefs of Stoicism and Christianity. Stoics has a concept called Ataraxia that’s similar to Nirvana in Buddhist spirituality, both referred to the state of “tranquility of mind”. It influenced the modern psychology to develop a method called Rational Emotive Behavioral Theraphy and Logotherapy, both based on stoic principle that human can maintain its willpower and attitude despite facing challenging circumstances. According to Stoics, the universe is material and reasoning substance, known as Nature, which is divided into two classes, the active and the passive. The passive substances are matter, and the active substances is Logos (Universal Reason), Human, an intelligent aether which acts on the passive matter. Everything is subject to the laws of Fate. And since the right Reason is the foundation of both humanity and the universe, it follows that the goal of life is to live according to Reason, that is, to live a life according to Nature. For me, I understand this as a principal value to live balancely according to the laws of nature. The universe is a web of cause and effects. We may not always have control over the events affecting us, we can have control over how we approach things. Sophia (Wisdom), the ability to navigate through complex situations in a logical, informed, and calm manner. Andreia (Courage), facing daily challenges with clarity and integrity, not just in extraordinary circumstances. Dikaiosyne (Justice), treating others with fairness, even if they’ve done wrong. 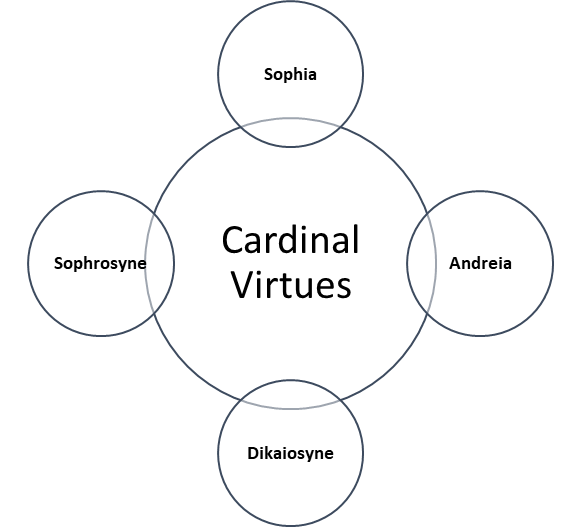 Sophrosyne (Temperance), the exercise of self-restrain and moderation in all aspects of life. While Stoicism focuses on personal improvements, it’s not a self-centered philosophy, nor encouraging passivity. By the initial establishment of Stoicism, Roman laws considered that slaves are property. And Seneca, one of the prominent Stoic, stressed that we all human share the same fundamental humanity, including the slaves, and demanded human treatment for them. There’s in an idea that only people who have cultivated virtue and self control in themselves, can bring positive change in others. So, a Stoic can’t be a passive nor self-centered person. It’s important to note that this isn’t a rhetorical advice, but an exercise. Sometimes it’s good to practice poverty, like take a little food, wear our worst clothes, and get away from our comfort zone. Comfort zone is the worst, because we’re always afraid that something or someone will take it away. But if we can not just anticipate but really practice misfortunes, when something bad happens to us, the chance of it to disrupt our life will fade because we’re already got used to it. This exercise is also called “Turning the Obstacle Upside Down”. Suppose for a second that you are trying to help someone and they respond by being surly or unwilling to cooperate. Instead of making your life more difficult, the philosophy of Stoics says that they’re actually directing you towards new virtues; for example, patience or understanding. Or another example: the death of someone close to use is actually a chance for us to show fortitude. “The impediment to action advances action. What stands in the way becomes the way.” -Marcus Aurelius. It is very important for us to remember that achivements can be ephemeral; and that our possession of them are just an instant. If everything is ephemeral, what does matter? Right now matters. Being a good person and doing the right thing right now, that’s what matters and that’s what was important to the Stoics. “Run down the list of those who felt intense ange at something: the most famous, the most unfortunate, the most hated, the most whatever. Where is all that now? Smoke, dust, legend… or not even a legend. Think of all examples. And how trivial the things we want so passionately are.” -Marcus Aurelius. As a matter of discussion, please correct me if I explain something wrong about this subject. I will really appreciate it if you want to help me perfecting this work. There is a fraction of Stoicism that I still disagree with, but what I am sharing in this is overall what lessons part that I think worth to share. And not just Mandela, its values were also shared by kings, presidents, artists, writers, and entrepreneurs that show it as a way of life; on the list are figures like George Washington, Thomas Jefferson, Adam Smith, and John Stuart Mill. Wow, just wow, such a very good form of writing. Just knew about stoics from your writing. I’m grateful to know this. Wish I could practice the stoics values.